Play the cutest virtual cat care game for girls and boys! Welcome to the magical world of rainbows and sparkles! Here, a tiny cat princess Twinkle is living in her royal palace! But she’s not your regular cat, she is a unicorn kitty! Her hair is rainbow and her fur is shimmery! So pretty! 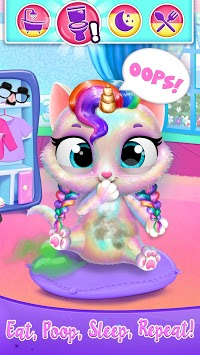 Become the best nanny for unicorn cat Twinkle! Feed, bathe, play, sing to sleep and dress up your new virtual pet friend! Help baby cat Twinkle hatch from her magical egg! Show the kitty around the royal palace and take good care of her! Watch Twinkle, the unicorn cat princess, grow from a tiny baby kitty into a sweet cat girl! Your little cat princess needs a lot of energy! Make sure to feed kitty Twinkle yummy food in the royal kitchen! Sing the unicorn kitten to sleep when she’s tired! Potty train kitty Twinkle and bathe the messy baby! Take care of her glittery fur with bubbly rainbow soap or a magical shimmery slime gel! 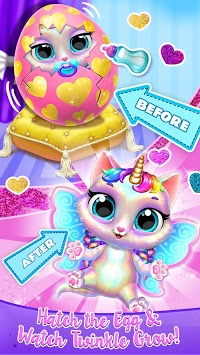 Dress up unicorn cat Twinkle in the cutest princess outfits! Girly dresses, fluffy skirts, fun glasses and glitter accessories! Decorate the princess palace the way you like! Paint, choose patterns and add decorations! Don’t forget that little princess Twinkle loves glitter, sparkles and everything royal! Play super fun mini games for kids with little cat princess Twinkle! Slide down the rainbow! Jump on the clouds! Run, jump and fly! 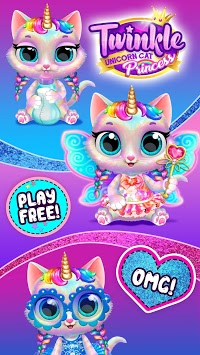 Play fun memory games with your unicorn cat princess! If you have any questions, email us at [email protected] We’ll be happy to help you!